The Justice Department can’t prosecute children along with their parents, so the natural result of the zero-tolerance policy has been a sharp rise in family separations. Nearly 2,000 immigrant children were separated from parents during six weeks in April and May, according to the Department of Homeland Security. The Trump administration implemented this policy by choice and could end it by choice. No law or court ruling mandates family separations. In fact, during its first 15 months, the Trump administration released nearly 100,000 immigrants who were apprehended at the U.S.-Mexico border, a total that includes more than 37,500 unaccompanied minors and more than 61,000 family members. We’ve published two fact-checks about family separations, but it turns out these Trumpian claims have a zombie quality and keep popping up in new ways. In the latest iteration, Homeland Security Secretary Kirstjen Nielsen tweeted and then said at a White House briefing that the administration does not have “a policy of separating families at the border.” This is Orwellian stuff. Granted, the administration has not written regulations or policy documents that advertise, “Hey, we’re going to separate families.” But that’s the inevitable consequence, as Nielsen and other Trump administration officials acknowledge. 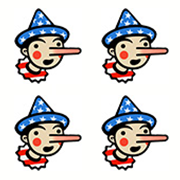 Although we’ve fact-checked these family-separation claims twice, we hadn’t had the opportunity to assign a Pinocchio rating yet. We’ll do so now. Since 2014, hundreds of thousands of children and families have fled to the United States because of rampant violence and gang activity in El Salvador, Guatemala and Honduras. U.S. laws provide asylum or refugee status to qualified applicants, but the Trump administration says smugglers and bad actors are exploiting these same laws to gain entry. Nielsen says the government has detected hundreds of cases of fraud among migrants traveling with children who are not their own. Trump says he wants to close what he describes as “loopholes” in these humanitarian-relief laws. The Central American refugee crisis developed during President Barack Obama’s administration and continues under Trump. The two administrations have taken different approaches. Obama prioritized the deportation of dangerous people. Once he took office, Trump issued an executive order rolling back much of the Obama-era framework. Obama’s guidelines prioritized the deportation of gang members, those who posed a national security risk and those who had committed felonies. Trump’s January 2017 executive order does not include a priority list for deportations and refers only to “criminal offenses,” which is broad enough to encompass serious felonies as well as misdemeanors. Then, in April 2018, Attorney General Jeff Sessions rolled out the zero-tolerance policy. When families or individuals are apprehended by the Border Patrol, they’re taken into DHS custody. Under the zero-tolerance policy, DHS officials refer any adult “believed to have committed any crime, including illegal entry,” to the Justice Department for prosecution. If they’re convicted, they’re usually sentenced to time served. The next step would be deportation proceedings. Families essentially are put on two different tracks. One track ends with deportation. The other doesn’t. After a holding period, DHS transfers children to the custody of the Office of Refugee Resettlement (ORR) in the Department of Health and Human Services. They spend an average 51 days at an ORR shelter before they’re placed with a sponsor in the United States, according to HHS. The government is required to place these children with family members whenever possible, even if those family members might be undocumented immigrants. “Approximately 85 percent of sponsors are parents” who were already in the country “or close family members,” according to HHS. Some children have no relatives available, and in those cases the government may keep them in shelters for longer periods of time while suitable sponsors are identified and vetted. Adding it all up, this means the Trump administration is operating a system in which immigrant families that are apprehended at the border get split up, because children go into a process in which they eventually get placed with sponsors in the country while their parents are prosecuted and potentially deported. This is a question of Trump and his Cabinet choosing to enforce some laws over others. The legal landscape did not change between the time the Trump administration released nearly 100,000 immigrants during its first 15 months and the time the zero-tolerance policy took effect in April 2018. What changed was the administration’s handling of these cases. Undocumented immigrant families seeking asylum previously were released and went into the civil court system, but now the parents are being detained and sent to criminal courts while their kids are resettled in the United States as though they were unaccompanied minors. The government has limited resources and cannot prosecute every crime, so setting up a system that prioritizes the prosecution of some offenses over others is a policy choice. The Supreme Court has said, “In our criminal justice system, the government retains ‘broad discretion’ as to whom to prosecute.” To charge or not to charge someone “generally rests entirely” on the prosecutor, the court has said. Katie Waldman, a spokeswoman for Nielsen, said the administration does not have a family-separation policy. But Waldman agreed that Trump officials are exercising their prosecutorial discretion to charge more illegal-entry offenses, which in turn causes more family separations. The Obama administration also separated immigrant families, she said. Waldman sent figures from fiscal 2010 through 2016 showing that, out of 2,362,966 adults apprehended at the southern border, 492,970, or 21 percent, were referred for prosecution. These figures include all adults, not just those who crossed with minor children, so they’re not a measure of how many families were separated under Obama. Trump administration officials say they’re trying to keep parents informed about their kids. But some families instead have wound up in wrenching scenarios. A 1997 federal consent decree that requires the government to release all children apprehended crossing the border. The “Flores” consent decree began as a class-action lawsuit. The Justice Department negotiated a settlement during President Bill Clinton’s administration. According to a 2016 decision by the U.S. Court of Appeals for the 9th Circuit, the Flores settlement requires the federal government to release rather than detain all undocumented immigrant children, whether they crossed with parents or alone. The agreement doesn’t cover any parents who might be accompanying those minors, but it doesn’t mandate that parents be prosecuted or that families be separated. Moreover, Congress could pass a law that overrides the terms of the Flores settlement. Waldman said the Flores settlement requires the government to keep immigrant families together for only 20 days, but no part of the consent decree requires that families be separated after 20 days. Courts have ruled that children must be released from detention facilities within 20 days under the Flores consent decree, but none of these legal developments prevents the government from releasing parents along with children. A 2008 law meant to curb human trafficking called the Trafficking Victims Protection Reauthorization Act (TVPRA). This law covers children of all nationalities except Canadians and Mexicans. Central American children who are apprehended trying to enter the United States must be released rather than detained under the terms of the TVPRA, and they’re exempt from prompt return to their home countries. The law passed with wide bipartisan support and was signed by a Republican president, George W. Bush. No part of the TVPRA requires family separations. The Immigration and Nationality Act of 1952. This comprehensive law governs U.S. immigration and citizenship and makes a person’s first illegal entry into the United States a misdemeanor. Clinton, Bush and Obama — the presidents who were in office during the immigration boom of the past few decades — never enforced the INA’s illegal-entry provision with the Trump administration’s zeal. The INA says nothing about separating families. It was sponsored by Democrats and passed by a Democratic-held Congress. President Harry Truman, also a Democrat, tried to veto the bill, describing it as a reactionary and “un-American” measure meant to keep out immigrants from Eastern Europe. Congress overrode his veto. It’s unclear whether 100 percent of adults are being prosecuted. Experts on the ground say there are not enough resources on the border to process all these cases. Trump administration officials say immigrants should show up at a port of entry to request asylum if they want to avoid prosecution, but there’s usually a big crowd and people often get turned away at these entry points, according to reporting from Texas Monthly. It’s strange to behold Trump distancing himself from the zero-tolerance policy (“the Democrats gave us that law”) while Nielsen claims it doesn’t exist (“it’s not a policy”) and Sessions defends it in speech after speech. The attorney general also suggested on June 7 that legal developments are forcing his hand. “Because of the Flores consent decree and a 9th Circuit Court decision, ICE can only keep families detained together for a very short period of time,” Sessions said. But as we’ve explained, this is misleading. Neither the consent decree nor the court ruling forces the government to separate families. What they do provide is accommodations for children that the government could extend to parents if it wanted to. For Trump, the family-separation policy is leverage as he seeks congressional funding for his promised border wall and other immigration priorities, according to reporting by The Washington Post. Top DHS officials have said that threatening adults with criminal charges and prison time would be the “most effective” way to reverse the rising number of illegal crossings. This includes illegal-entry misdemeanors, which are being prosecuted at a rate not seen in previous administrations. Because the act of crossing itself is now being treated as an offense worthy of prosecution, any family that enters the United States illegally is likely to end up separated. Nielsen may choose not to call this a “family separation policy,” but that’s precisely the effect it has. Sessions, who otherwise owns up to what’s happening, has suggested that the Flores settlement and a court ruling are forcing his hand. They’re not. At heart, this is an issue of prosecutorial discretion: his discretion.